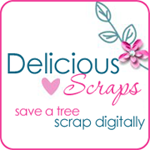 Delicious Scraps: CUFO Blog Train!! CU Freebies Only Forum has a blog train!! :) Jump on it and download all the great freebies offered - made with CU Freebies from the Forum!! Click on the blinkie to visit the forum for tons of CU Freebies!! Here is my part! It is Personal and Commercial Use OK, bows made with RoseLi's actions used with her permission. Check out more CUFO Blogtrain Freebies! Thanks so much for sharing with us. You are very generous, and we love your blog! What a super kit! And a great blog! Such wonderful CU items! Thank you so much! Thank you so much for the CU items!